Join this Marketing Program for Sellers to Boost your business! Day 8 Assignment, Bootcamp #4 - List your Best Products! Day 6 Assignment, Bootcamp #4 - Review "Silver Workshop"
Day 5 Assignment, Bootcamp #4 - Review "Red Rock Designs"
Day 4 Assignment, Bootcamp #4 - Review "Jewelry by Kat"
Day 3 Assignment, Bootcamp #4 - Review "JaJeJems"
Day 2 Assignment, Bootcamp #4 - Review "Fairy Cardmaker"
Day 1 Assignment, Bootcamp #4 - Review "Delightful Suds"
This is going to be a 4-weeks marketing program (weekends off) that will get us into the habit of effective and consistent marketing, with low- to no-cost methods: and at least 30 minutes of your time daily. Bootcamp will be about establishing routines and disciplines to do the daily marketing activities needed to keep your business growing. It will be also about meeting some of your online neighbours and iCraft family, so from hereafter you will always have a support system. All our Bootcamps are slightly different. However, most likely, we'll always start with the review of your store, provide your with the feedback and suggestions for improvements (SEO, prices, store policies, product photos etc.) and then get into the actual promotional activities. We do things in a certain order because it doesn't make sense to drive traffic to pages that have problems. They will not convert your visitors into buyers. We post Daily Assignments on Forum for Bootcampers to follow. The next day you will see a new assignment again, and so on for each of the remaining days. We will make this fun and interesting (sometimes with free stuff too!). To sign-up for this program and to qualify for iCraft incentives, please go to "My Profile" and check "Yes, sign me up for the "Sellers' Bootcamp" program!" checkbox. Please Note: Once Bootcamp starts, we won't be taking on new participants! However, you can sign up for future Bootcamp. Right now we take on 10 Participants Max! Check back about the dates for our next Bootcamp. Even though you can't participate now, you can still follow current Bootcamp's posts or see previous Bootcamp's posts, including daily assignments, on our forum. We'd like to hear what worked and what didn't work for you in the past, if you participated before, or what you'd like to learn, if you decide to participate in this program next time. One of the ways online sellers can benefit from marketing and selling success strategies is through the selling venues that they use. You can find a lot of selling, promotional, and marketing tips in the venue's documentation that is very valuable! The forums on each of the venues becomes a treasure trove of shared experiences about everything for selling online. Use it! Learn low- to no-cost methods of marketing and advertising your online business with Sellers’ Bootcamp. See Daily Assigntments from previous Bootcamps on our forum. Christine came up with this brilliant idea of creating a program for iCraft Sellers, where we could provide them with marketing and advertising tips in small daily doses. With Christine's help, we ran a few successful Bootcamps already. We will always be grateful to her for suggesting this idea to us, so we wanted to give her a credit for it on the Sellers' Bootcamp page. I've retired from a 26 year career of "suits and sales" and part of my professional background was sales training, technical instructing and strategic planning. I've seen this lousy economy before. However, people are still spending: so why are they not shopping at my store??? I thought we need a program that takes us back to basics. 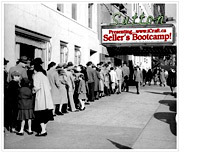 That's how the idea of "Sellers' Bootcamp" was born.